THE GOSPEL treks through different textures and rhythms, crafting a diverse album that finds itself diving deeper into the alt-rock territory of Iggy Pop and the Stooges than it does of ’s earlier post-industrial material. From the whiskey-drenched swank and howl of “Found in Filth” to the insidious and slinky grind of “Toleration Or Truth” to the swirling sweaty driving anthem of “I’m So Wrong”, it’s an album that defies simple categorization, punctuated by Watts’ distinctively dark growl. 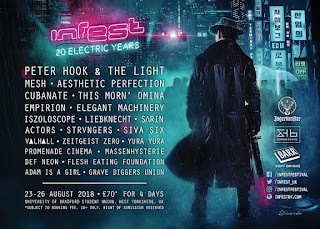 Co-written with Marc Thwaite (Peter Murphy) and Z.Marr (Combichrist) who also co-produces.and does double-duty with programming, guitars and additional vocals, is rounded out with Watt’s former KMFDM bandmates En Esch on programming, guitars, vocals and Guenter Schulz on guitar. With THE GOSPEL ready for release in September, will be hitting the road for the “American Excess Tour” throughout North America this Fall (tour dates below). “This tour will be a coming together of the old(er) and the new,” Watts explains about the tour’s planned setlist. “I never really feel as safe on stage as when I have a great big bald German to my left (En Esch) and to my right, Guenter Schulz, probably one of Germany's more amiable and memorable exports… my idea of heaven, and I'm just glad they're on my side. Also in the trenches with me are Galen Waling [drummer for Julien-K, Left Spine Down and formerly 16 Volt] and Z.Marr.” Supporting the tour will be En Esch's industrial/mutant/disco/zombie/art rock solo project Peter Turns Pirate with Combichrist drummer Joe Letz adding his DJ skills between sets. Available for purchase exclusively on this tour is the vinyl-only release RISE AND REPENT, containing additional remixes of tracks from THE GOSPEL and previously unreleased material. is Raymond Watts (vocals, programming, guitars), Z. Marr (programming, guitars, additional vocals), and En Esch (programming, guitars, additional vocals). THE GOSPEL will be released on September 9, 2016 via Metropolis Records.